14:07 | Lima, Jul. 25. Peruvian President Ollanta Humala Tasso met on Friday morning in Lima with his Royal Highness Prince Mired Raad Al Hussein of Jordan, who is visiting the Andean Nation as special envoy of the Anti-Personnel Mine Ban Convention, or Ottawa Treaty. 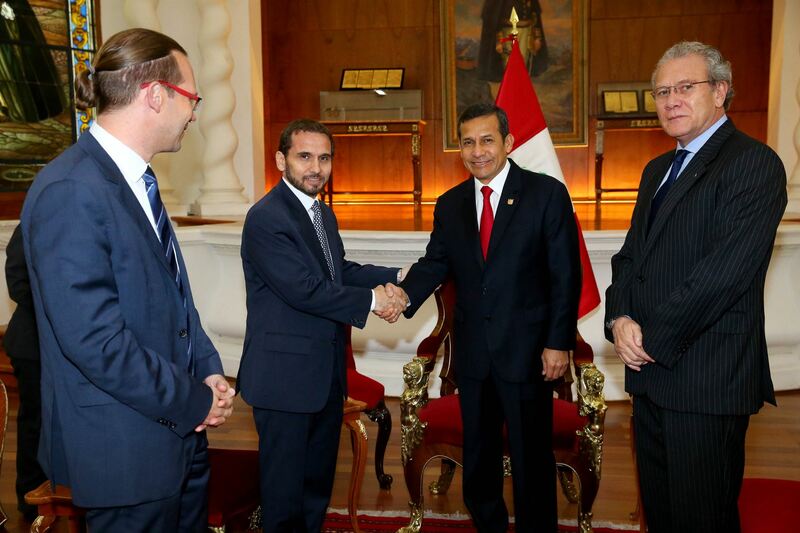 During the meeting held at the presidential palace, the Andean country's leader and Prince Mired discussed the situation of humanitarian demining process in Peru, support for victims of anti-personnel landmines, education in this field and international cooperation. Likewise, Jordan's Prince commended the Ollanta Humala administration' efforts in the implementation of the Ottawa Treaty and highlighted the importance of a land free of mines. The treaty aims at eliminating anti-personnel landmines around the world. It is worth mentioning that humanitarian demining has been an efficient measure to strengthen ties of mutual trust between Peru and Ecuador as well as to continue bilateral cooperation. Furthermore, humanitarian demining contributes to sustainable productive and social development, and improves the quality of life of people threatened by the existence of anti-personnel mines and their economic and social integration and reintegration. The Anti-Personnel Mine Ban Convention was adopted in Oslo in 1997, opened for signature in Ottawa the same year and entered into force on 1 March 1999. To date, 161 States have joined the Convention. Since entering into force, millions of square meters of once dangerous lands have been released for normal human activity and more than 47.5 million stockpiled mines have been destroyed.